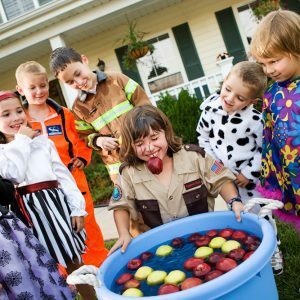 With Halloween coming up, now is the perfect time to start planning ahead for fun Halloween games you and the whole family can enjoy in your very own backyard! 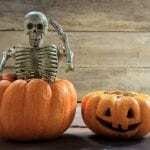 Get a head start on decorating to ensure Halloween fun and safety for children who may visit your house and the spookiest night of the year. You may have thought about stocking up on candy, putting up scary decorations and carving the perfect pumpkin, but there is one part of your home that needs some extra attention this time of year: the lawn. Trick-or-treaters notoriously ignore sidewalks in favor of the more direct path straight through your lawn. Fortunately, our artificial grass withstands heavy use and maintains a beautiful look for your Kansas City home year-round. Artificial grass keeps your lawn presentable and safe for the kids to play on! Our low-maintenance lawns also look great all year long, making them the perfect solution for your party preparations and fun Halloween games! 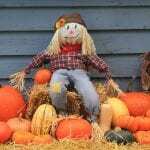 Get some hay, a few pumpkins, and accessories to decorate a scarecrow. We recommend cute details such as overalls, hats, and old, worn-out plaid shirts you might have lying around the house. Divide into teams of 2-4, depending on players and supplies, and take 20 minutes to build the best, silliest or scariest scarecrow! Create a simple, but fun searching game by getting two or more sets of plastic skeleton bones and hiding them around the yard. Organize into teams and start looking! Each team must find all their bones and reassemble their skeleton before time runs out. The winners get extra bags of candy or small plastic toys to play with. This course is fun and easy to make with only a few inexpensive props and items found around the house. Mix and match the following items to customize your very own home Halloween obstacle course that is family-friendly and fun for everyone. Chase the Ghost: Players must get a white balloon (the ghost) from start to finish without holding it or letting it touch the ground. Bone Crawl: Buy a crawling tunnel or build one yourself out of large cardboard boxes and scatter plastic bones, spider web decorations and other spooky items inside. Ghost Lasso: Stake some helium balloons to the ground and cover them with white trash bags or sheets to create the illusion of a floating ghost, then have players try to “lasso” a ghost by throwing hula hoops over them, similar to a game of horseshoes! Gut Grabbers: Cook a ton of spaghetti noodles and fill a kiddie pool with them – add spaghetti sauce for a super creepy look that will also taste delicious. Hide Halloween-themed goodies in the mix, such as skeletons, plastic spiders or even candy. First one to find their specific item wins. Synthetic grass is a great way to keep the Kansas City trick-or-treaters happy while maintaining a lush, green look year-round. Our grass provides a safe surface for children and pets, and helps protect them from injury in the event of a slip or fall. Halloween safety is an important factor to consider as the spooky season approaches, so plan accordingly, keep an eye on your kids, and have fun! If you’re interested in getting artificial grass installed at your home, call us at (816) 272-5938 or contact us online and get a FREE design quote today!